The WEMPE NAVIGATOR I Series with its technic-oriented look is especially appealing to owners of modern yachts. The products are designed by Gabriel Scholl and are a real highlight among the marine instruments of the traditional German company. The long-standing expertise of 110 years results in unimpeachable quality. You can look forward to a modern ship clock that is equipped with a battery-powered quartz movement. The WEMPE NAVIGATOR I Series is completed by a combination panel, consisting of a double aneroid barometer, a thermometer, and a hygrometer. The enclosure is 130mm in diameter and bead blasted. This gives the surface its titanium-like appearance. The clock face has a diameter of 100mm and is divided in two parts: the inner anthracite-coloured area with white indexes and the outer ring in dark brown with Arabic numerals. 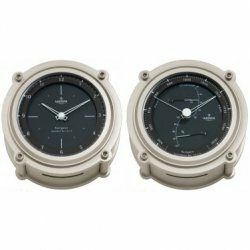 The Navigator I Series is not available anymore. Please take a look at the following series though. Navigator II.